Hallo at all, I see this on Twitter. I can’t understand english podcast very well, if Someone is going to listen this podcast, can please post some comments here? @giaciak2 I'll definitely listen to it this week and report back for you. I'm sure you know, but the Mortis Arc is from The Clone Wars cartoon, season 3, episodes 16, 17, and 18 - I think. I can't stress enough - I THINK. I know it's season 3. 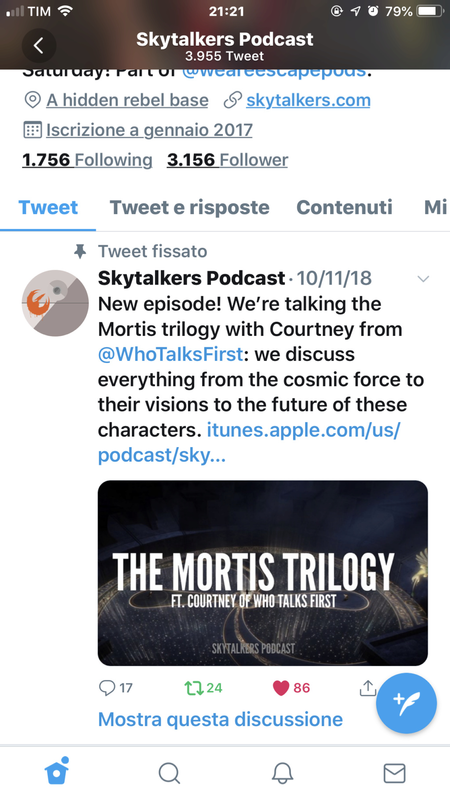 Just look for the two episodes with Mortis in the title, and the one prior to them make up the entirety of the Mortis Arc. I've been meaning to listen to this pod, but I've been distracted - thanks for the motivation! 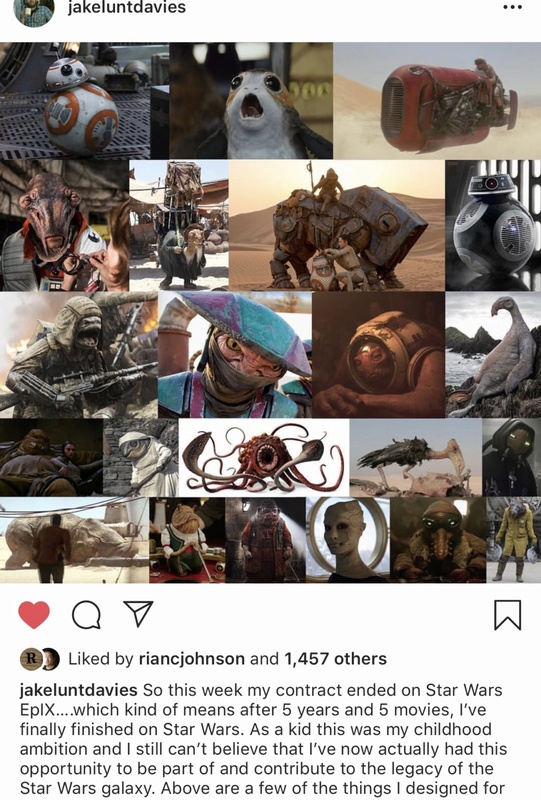 Worth a mention from one of the concept designers from all sequal SW films and Rogue1. He declared his contract ended this week for IX. 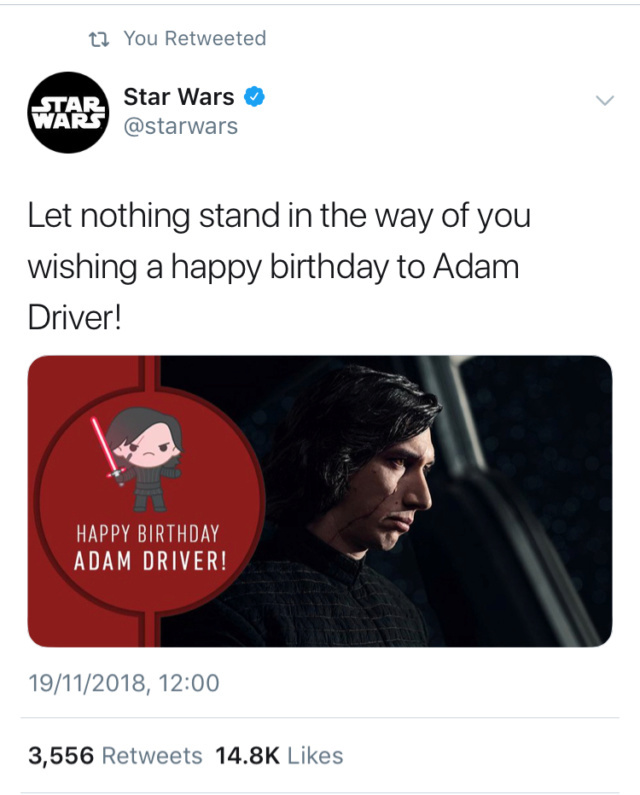 Happy Birthday Adam! Long live our Supreme Leader! @giaciak2 I listened to the pod. It was a pretty in-depth discussion (as you'd imagine.) Have you seen the Mortis Arc of the Clone Wars? It'd be very helpful to have seen it, if you haven't. Symbolically, the dark is at the heart of the light, and the light is at the heart of the dark. Question for Reylo: is there a need for a third party to provide balance or can they do it alone? My thought: I think they can because neither Kylo nor Rey is pure light or pure dark, unlike the Son and Daughter. There was more, but it might be helpful to have questions to answer, if that makes sense. 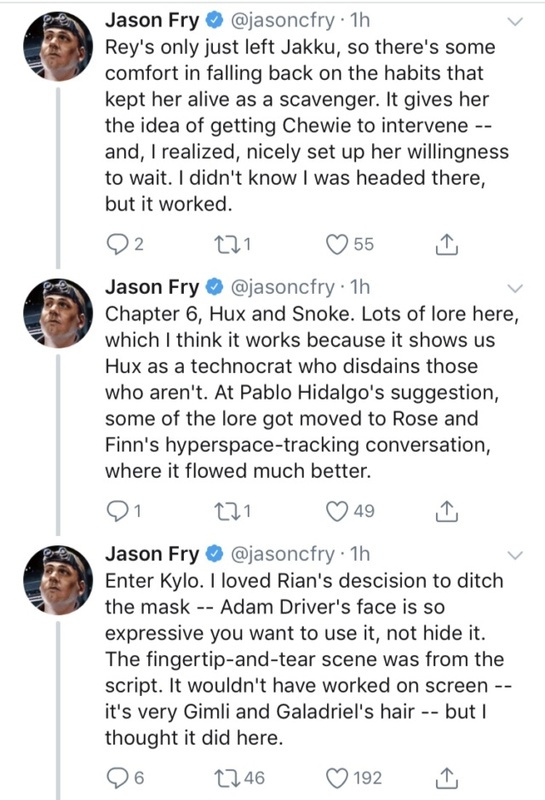 "my nice not nefarious space nephew who should smile more"
Also, they (Leia and Rey) both have the response of "Oh" I shall be fair, and indicate that Rey's is not in the movie...yet...it is in the novelization! Imagine, there was actual multi-movie foresight and character development involved. And GL approves. It's even somewhat along the lines of his own vision. Contrary to the popular opinion in certain segments of fandom. 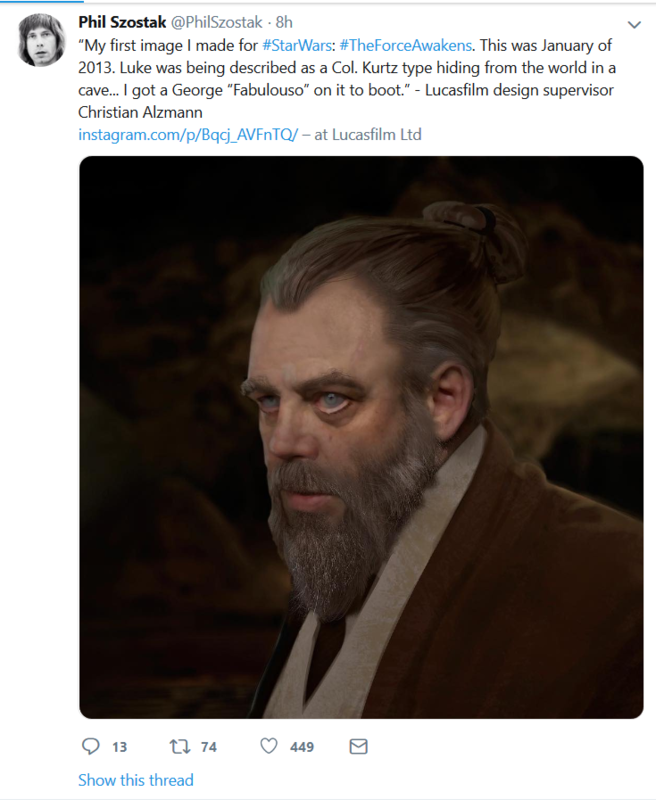 I adore Mark, yet I really wish this would imprint on him because it's his comments - when he just talks or writes without thinking - but thinking of a Marvel-DC-type Luke that seems to feed the antis that troll Rian, Kathleen, LF...sigh. 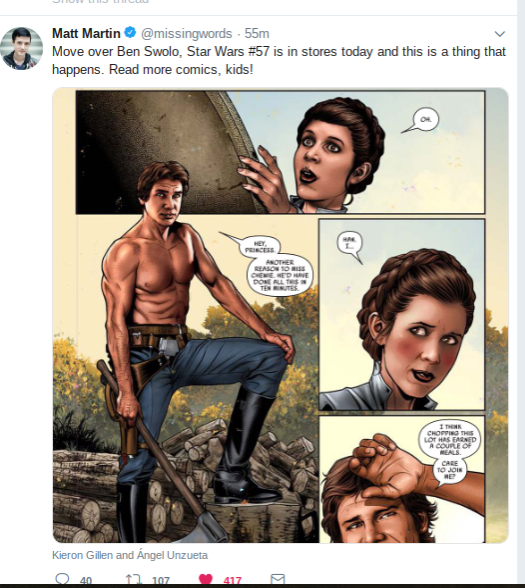 I get the sense he is aware of all this, but his Saturday morning cartoon ideas about Luke interfere with his logic. lol Although, he has been behaving himself a lot better now, which I have a feeling came more from a request (lecture? lol), versus self-reflection. @californiagirl Love that tweet from Jason. Wonder what prompted that tweet tho? @Riri wrote: @californiagirl Love that tweet from Jason. Wonder what prompted that tweet tho? 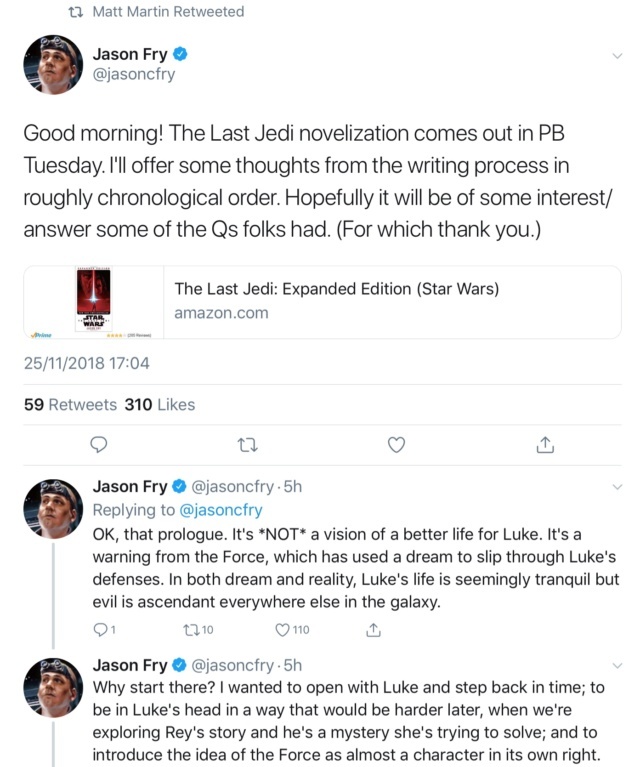 So Jason Fry is posting some thoughts / explanations on the TLJ novelization. First 4 chapters for now. I only did a screenshot of the beginning of the thread. For the rest click on the link. 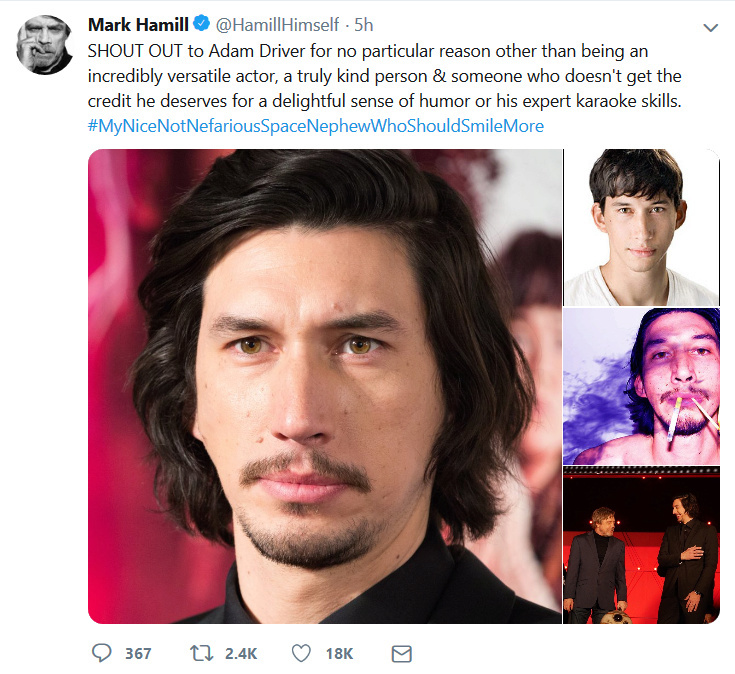 I’m biting my nails waiting to read his new commentary on Kylo. 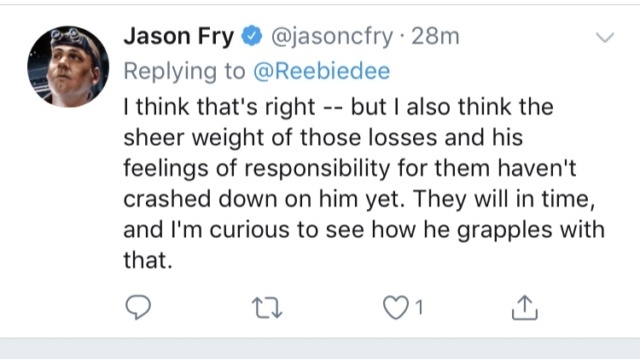 Jason’s thread is an absolute gem. Offered some great new insights and makes me want to read TLJ’s script even more. Phew, nothing controversial so far. 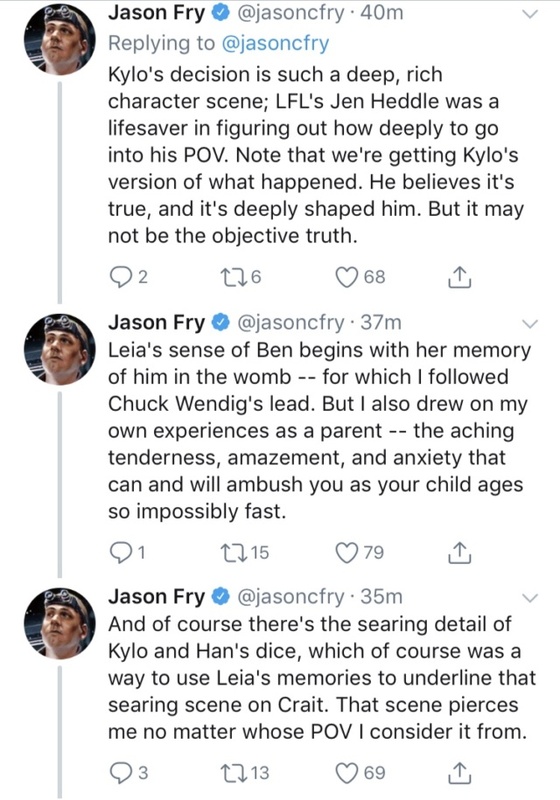 I was really touched by how his own parental sentiments went in to writing Leia and Ben. 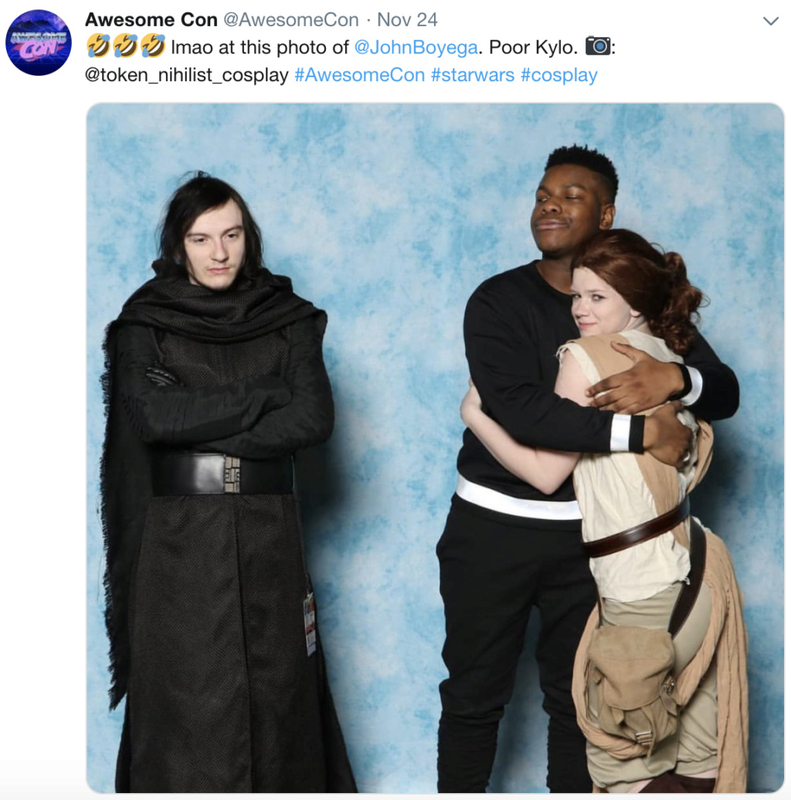 I mean, this is adorable but what I most love is that it is implicitly Reylo. 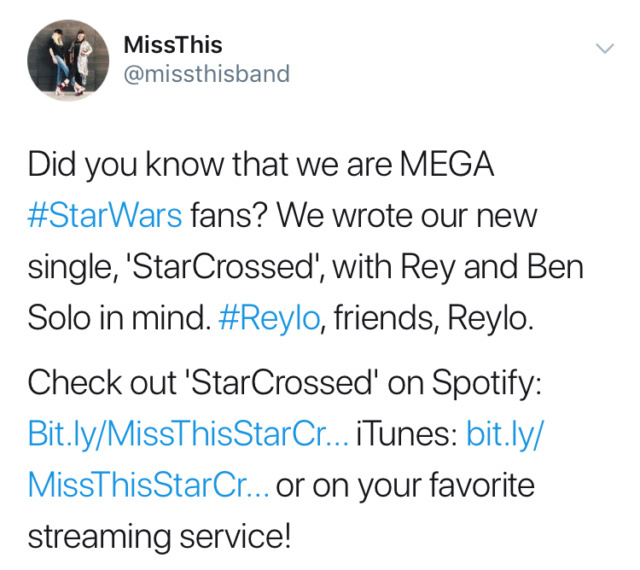 I love that we're at the point where Reylo is openly acknowledged, even in unspoken ways. They all look so cute here. "It's important to forgive people. When you don't, nobody wins." 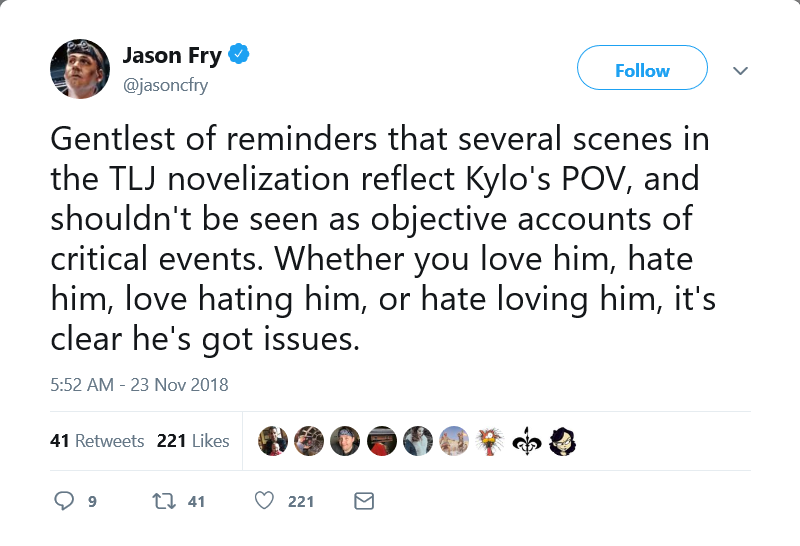 We have read/heard those say "What Kylo did - killing Han - is unforgivable." Well, in the novelization of TFA, Han forgave. In the novelization of TLJ, Leia forgave. 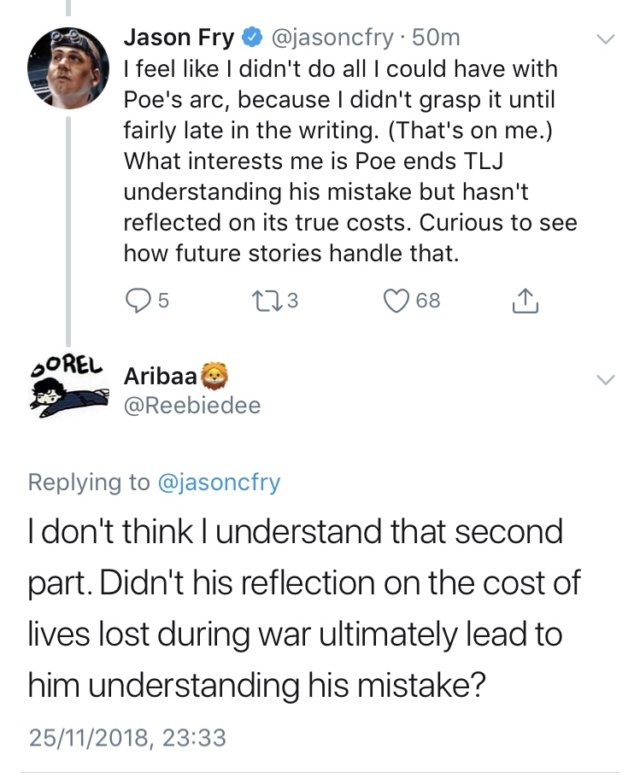 In TLJ, it is obvious Rey forgave...so LF in Resistance is indicating - this is our thesis...this is not a hurdle for us. @PalmettoBlue Thank you very much !!! 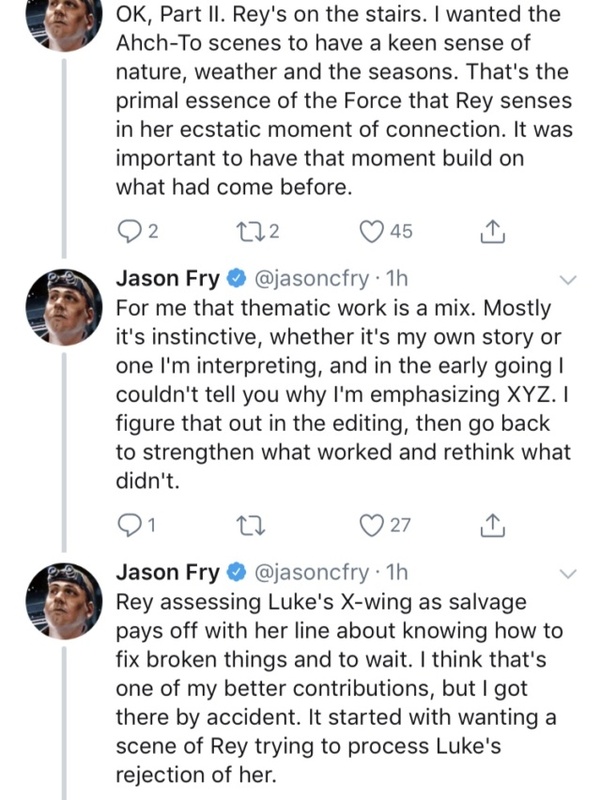 I went ahead and moved the current discussion on Jason Fry's tweets to Fan Fatigue and Ambiguity in TFA/TLJ/IX. Please continue the current discussion topic in that thread. Other discussions on his tweets can continue here.